Are you having a hard time losing weight because you simply can't do without something sweet in the day? Or, perhaps, you're struggling to manage your blood sugar, for this same reason? Now, you can finally relax! Take a look below for GUILT-FREE sweet delicacies that won't spike your blood sugar or hinder your weight loss efforts! Sweet treats that are actually GOOD for you! 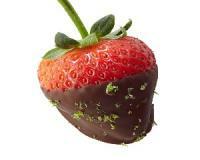 Dip sweet strawberries in melted dark chocolate (70% cacao). The chocolate and the berries in this sweet delicacy are ideal for weight watchers and diabetics because they're low in carbs - and contain natural sugars. Have up to three quarters of a cup of this sweet delicacy gulit-free! The perfect frozen sweet treat to relish without worry! Bananas are high in fibre, potassium and a great source of vitamins C and B6. Peel a banana, cut into two equal halves, and freeze. When solid, take out and roll in melted dark chocolate. Then, while the chocolate’s still melty, roll in granola or chopped nuts. Return to the freezer for at least an hour, until the chocolate is set and then enjoy! Turn every cell in your body into a fat burning machine! L-carnitine works by helping your body turn food into fuel and transporting it to the energy centre of each cell. That means your body is more efficient at turning fat into useful energy. And helping you lose weight faster! According to the International Sports Science Associations, in 1997, researchers studied the effects of L-carnitine on weight loss in obese teenagers between the age of 13 and 17. Both groups received nutritional education, physical training and controlled diets, but one group also took L-carnitine every day and the other group took a placebo. At the end of the three-month study, both groups of students lost weight. But the group taking L-carnitine lost an average of 5kg of weight while the group taking the placebo lost an average of about 600g of weight. That’s seven times more weight loss! Top one cup of plain yoghurt with your favourite fruit, a springling of nuts and a dusting of dark chocolate. If you must, sprinkle a tiny bit of xylitol on too. It's a great protein source with all the yumminess for the fussiest sweet tooth! The perfect treat for after-supper: Melt some dark chocolate in a cup of milk and stir well for a creamy treat that will help you sleep well! You can have the best of both worlds with these treats - a great figure, balanced blood sugar and scrmptious treats!